Dutch printer; born at Amsterdam 1623; died there Jan. 27, 1715 (not at Zolkiev in 1713, as Steinschneider records); son of Aaron ha-Levi, ḥazzan at the Neweh Shalom Synagogue, Amsterdam, and grandson of Moses Uri ha-Levi, founder and first ḥakam of the Spanish-Portuguese congregation in that city. After having first worked as a typesetter for Immanuel Benveniste, in whose establishment he printed Pappenheim's edition of the "Mishle Ḥakamim" in 1656, Phoebus opened an establishment of his own in 1658 and carried on business as a printer till 1689. His imprint was a ewer and two fishes. In the first year he printed several books, among them a prayer-book of the German ritual. The last work he issued was a Sephardic Maḥzor, completed in 1689. 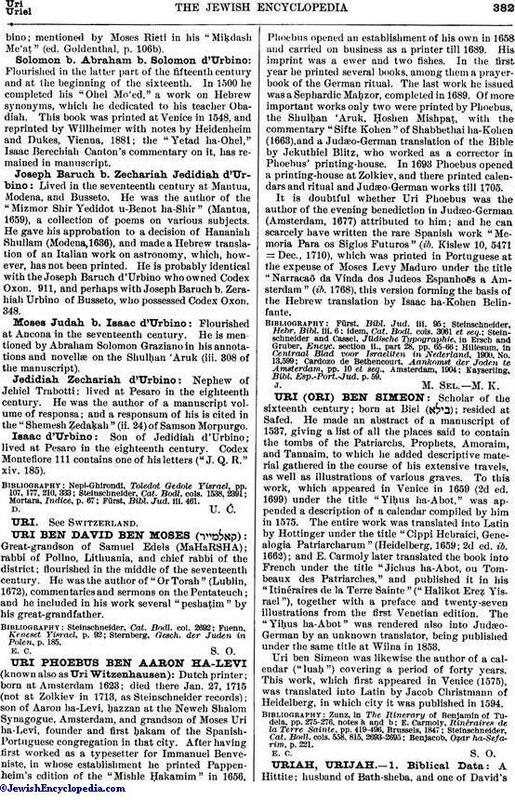 Of more important works only two were printed by Phoebus, the Shulḥan 'Aruk, Ḥoshen Mishpaṭ, with the commentary "Sifte Kohen" of Shabbethai ha-Kohen (1663), and a Judæo-German translation of the Bible by Jekuthiel Blitz, who worked as a corrector in Phoebus' printing-house. In 1693 Phoebus opened a printing-house at Zolkiev, and there printed calendars and ritual and Judæo-German works till 1705. It is doubtful whether Uri Phoebus was the author of the evening benediction in Judæo-German (Amsterdam, 1677) attributed to him; and he can scarcely have written the rare Spanish work "Memoria Para os Siglos Futuros" (ib. Kislew 10, 5471 = Dec., 1710), which was printed in Portuguese at the expense of Moses Levy Maduro under the title "Narracaõ da Vinda dos Judeos Espanhoẽs a Amsterdam" (ib. 1768), this version forming the basis of the Hebrew translation by Isaac ha-Kohen Belinfante. Kayserling, Bibl. Esp.-Port.-Jud. p. 59. J. M. Sel. M. K.